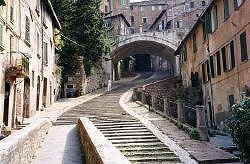 In 1254 the city of Perugia decided to build an approximately three km long aqueduct from Monte Pacciano to Piazza Grande, within the city. This square is now called Piazza IV Novembre. The acqueduct ran along Via del Fagiano (formerly Via dei Condotti), Via dell’Acquedotto and Via Appia. The Venetian architect Boninsegna was commissioned to build the acqueduct. The final part of the structure ran between the Conca area of town and the Etruscan town walls. In 1812 this became a popular walk, and the acqueduct was surmounted by railings along the top of its Medieval arches. Access into town was then through the Arco dell’Acquedotto gate or via the Arco di Via Appia. The aqueduct ended at the Fontana Maggiore in Piazza Grande (or della Fontana, now Piazza IV Novembre), between the cathedral and Palazzo dei Priori.